Portimão is base for the majority of the hotel services in the Algarve. Settlements such as Alvor or Praia da Rocha offers visitors an exceptional scenery and wonderful beaches to rest and practice water sports. 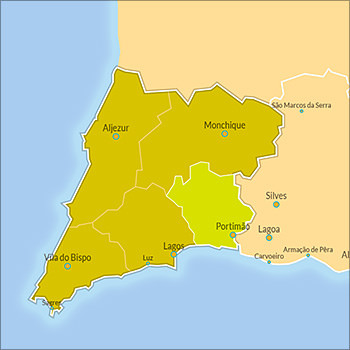 The council of Portimão is divided in 3 mains parishes: Alvor, Mexilhoeira Grande and Portimão. It's around 70Km (~40Mi) from Faro International Airport (FAO), and it should take about 60 minutes by car if you take the A22 motorway. The city has a complex layout of one way streets, so it's a good idea to have a map or GPS and the correct address of where you are heading.